Bah humbug… or maybe not?! Like every morning, this morning I made my mad dash to the train station and hopped aboard the 7.10am set for Birmingham. Scrabbling to find a seat, I sat next to what I would – in normal circumstances – describe as a ‘businessman’. But this was no ordinary businessman, this was a man decked out in a business suit, donning a watch that looked so expensive I wouldn’t even know how to spell let alone pronounce. And his downfall? Well, as I was becoming increasingly irritated by the tapping sounds he was making on his ipad I glanced over to see what he was writing. To my horrors, what I saw was none other than a Christmas present list. Apparently ‘Sarah’ is getting a laptop, while his gran is being treated to tickets to the Strictly live show. My curiosity did see me gawping over his shoulder for a substantial amount of time – to the extent that I could tell you what all his other seemingly family members were getting – before it became blatantly obvious I was reading his notes. What, you may ask is wrong with this, well….I would like to point out it’s only the first week in October and we haven’t even celebrated Halloween yet, (and all the other bits in between – there’s now ‘Stoptober’ and ‘Movember’ to think about) let alone to start thinking about Christmas so early on. Despite all this eagerness to celebrate the festive season, Mr Christmas-business man got me thinking, clearly marketing surrounding the season of goodwill and all that is already having its desired effect on him. But, how can businesses within the sports sphere ensure that they’re getting a look in too? Naturally, when people think of sport they think of the summer, good weather and enjoying watching people, and participating themselves, in activities, mostly outdoors. But of course we all know this isn’t the reality. To be a good sportsman or even to be the person or organisations that makes sports happen, months and months of planning (and training) needs to occur. A key part of this planning is the role of marketing. And, with New Year to think of straight after the festive season there’s no better time to start positioning your brand than when everybody has had their fill of mince pies and brandy and wants to focus on getting fit. In the past we’ve worked with a number of national governing bodies and sports organisations who recognise the valuable opportunity effective planning can make to the bottom line of their organisation’s needs. So perhaps there is some merit to Mr Christmas-businessman’s enthusiasm towards the festive season, albeit on October 1! Getting a plan in place to ensure that come Jan 1 2014 your NGB or organisation is at the top of the pecking order when it comes to getting the biggest reach possible, isn’t such a bad idea afterall. 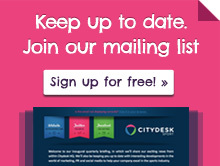 At Citydesk Sport we’ve got the luxury of scheduling our social media posts and press release distributions months ahead. With our integrated marketing approach we make sure all bases are covered so that you don’t have to worry. Afterall, nobody wants to be stuck in work on Dec 25 writing up their sports marketing plans for the New Year. Kate Allum is head of Social Media at Citydesk Sport.